Bigfoot Mountain Guides: Answering the Question "Why?" If you're reading this there's a good chance you're a climber. For nearly all of us, as climbers, in the beginning there's just "climbing". Somebody offers you a toprope, you take a gym class or a guided trip, you go with some friends to boulders and scramble around or you just see cliffs and become intrigued. If we take a step back it's easy to see how simple climbing is at first. You build an anchor that will hold the rope at the top of the cliff. You tie in with a figure eight knot and climb. Your partner belays. You switch roles. The movement is really enjoyable and the thrill of it all is amazing. At some point though, climbing also becomes anchor building, knot tying, protection placing, route finding, stance management, being a good and thoughtful communicator and many more things. However, there are numerous different ways to build anchors, so many different knots we can tie, multiple different types of protection we can place, route finding is really difficult at times, anchor stances get really messy , and we burn through climbing partners if we're not thoughtful and considerate climbers. How do we make the right decisions though? We do this using logic and reasoning, based upon our past experiences and knowledge that we currently have about the gear we're using or the route we're climbing. Before I was a guide, I was a climber and I did all of the things other climbers did and still do. I built anchors, climbed, belayed and rappelled. I navigated the murky waters of climbing "self-sufficiency" unharmed. I remember toproping off of anchors built entirely of runners chained together, and I clearly remember belaying off my waist at the top of the cliff many times. I didn't know that there were different, better ways of doing things. In 2003, after climbing a lot on my own for 5 years, I took an AMGA Rock Instructor Course in North Conway, New Hampshire. This 10-day course changed my life. 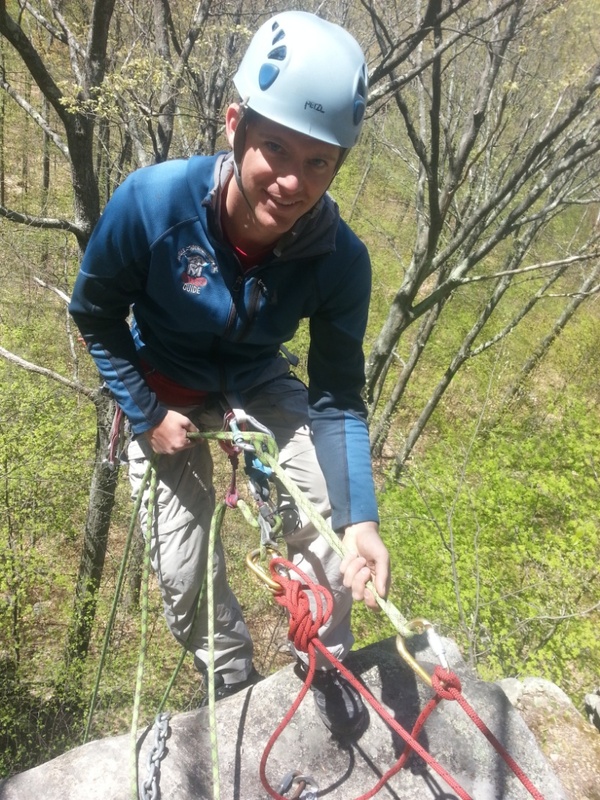 Among other things, the RIC helped me make decisions about which knot to tie, which friction hitch to use, how to protect traverses, and how to make sure I was always able to communicate with my climbing partner. While the course is focused on new guides/instructors it is also one of the best courses any multi-pitch climber looking for additional skills can take. Gone are the days when I would have to use prusik hitches to ascend the rope past an overhang I couldn't climb. I no longer yell my head off trying to communicate with partners I can't see. I don't rappel off some crappy little tree because I know there's usually a good anchor somewhere nearby and I definitely don't junk up existing anchors with additional material. Now I choose the right belay device for the task at hand, build anchors carefully and pick the right knots for specific situations. strand is redirected for optimal control. Back in 2003 I would have told you that the Rock Instructor Course showed me new, better techniques to use while climbing and guiding. Now, I know that the RIC actually helped teach me how to think critically about every situation I encounter as a climber. This ability to think critically about everything we do is the most important thing we do as climbers. Since 2003 I've worked with more budding instructors and climbers looking for skills than I can count. Like a 3-year old, I'm constantly asking each person I work with "Why?". 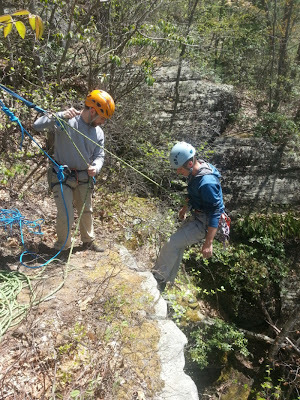 Why are you belaying here? Why are we tying two ropes together with a flat overhand vs. a flemish bend vs. a grapevine knot? Why should we be careful using sewn runners for personal anchoring? There are so many "why's" we need to answer - and a reason for everything we do as climbers. of multipitch climbing and descent transitions. This year I've already worked approximately twenty days with people looking for answers to the question "Why?". I'm glad so many people want to know as much as possible about the really dangerous pastime they love. However, I'm also concerned. The climbing population has exploded, and for every person that comes to me looking for skills and help with their climbing "logic" there are tens of others coming straight from a climbing gym with scant knowledge about climbing and very little awareness of the risks associated with hitting hard, rocky ground from a long way up. As climbers we should leave as little to chance as possible. Mistakes in the climbing world frequently result in serious injury or death. There can be no haphazard decisions; everything we do should be deliberate. So, if you're not thinking wisely about every single decision you make as a climber maybe you should reconsider how "safe" you actually are out there. It's never too late to learn new things, and self assessment and debriefing is critical if we're going to make the best decisions at all times.